I think I love caramel even more than chocolate. It's a big call I know but when you feel like drinking a whole jugful of caramel sauce it's pretty clear you're a caramelaholic! 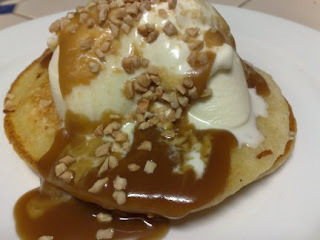 Last night we had pancakes with icecream, homemade caramel sauce and crushed peanuts for dessert. Yum! The perfect Saturday night dessert really - easy, fun and delicious. Place the flour, baking powder and sugar in a bowl. In a separate bowl place the milk, buttermilk, butter and egg and whisk until combined. Add the milk mixture to the flour mixture and whisk until smooth. Heat a non-stick frying pan over medium heat. Pour 1/3 cup mixture for each pancake into the pan, doing as many per batch as your frypan will hold. Cook until bubbles appear on the surface then turn and cook for another minute or until golden. Combine in a small saucepan over medium heat and stir until sugar is disolved. Increase the heat and simmer rapidly for 8 minutes or until the sauce thickens. Allow to cool until thick enough to spoon over cake or icecream. wow, this looks delicious susan! what a way to dress up pancakes! I love caramel also, maybe even more then chocolate and those pancakes look fantastic yum!!! love. caramel. This looks so luscious. mmmmmmm i love caramel as much as you do!!!! this looks to die for!